One fateful day, all of humanity turned to stone. Many millennia later, Taiju frees himself from the petrification and finds himself surrounded by statues. The situation looks grim—until he runs into his science-loving friend Senku! Together they plan to restart civilization with the power of science! 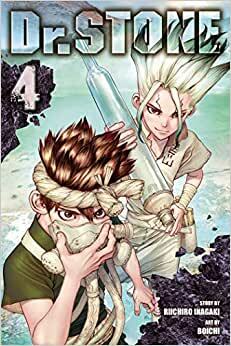 Start reading Dr. STONE, Vol. 4: Senku's Lab on your Kindle in under a minute. Boichi is a Korean-born artist currently living and working in Japan. His previous works include Sun-Ken Rock and Terra Formars Asimov. Riichiro Inagaki is a Japanese manga writer from Tokyo. He is the writer for the sports manga series Eyeshield 21, which was serialized in Weekly Shonen Jump.